By its very name, Broad Street evokes thoughts of a wide roadway, and indeed it was aptly described. Broad is one of Columbus’ widest city streets. Through most of its length, it consists of 6-8 lanes- 4-6 for traffic and 2 more for a mix of traffic and parking. It’s literally as wide as a highway. As such, the street has been dominated by cars for well over a century. Occasionally over the decades, the city has talked about remaking Broad Street into a far more pedestrian and transit-friendly design. While previous discussions have revolved around remaking the Downtown portion of Broad- all of which fell by the wayside- the city is now talking about a “road diet” for Broad Street through most of Franklinton. To say the least, the plans have been underwhelming for reasons that I will get into a bit later. First, let’s take a look at the history of Broad Street and how it got to its present state. Broad Street’s origins go all the way back to 1797 when the first section of what would become the road was constructed through the village of Franklinton, Central Ohio’s first community and hopeful capital of the state. Franklinton had applied for the capital position but had been rejected in part due to its precarious location on the flood plain of the Scioto and Olentangy confluence. Instead, the brand new village of Columbus was created on higher ground on the opposite side of the Scioto. Between 1812 and 1813, Columbus’ first streets were laid out, including High, Town, Front, State and Broad. These streets had been cut through deep forest, and many of the tree stumps were actually left behind due to a lack of funding- and likely motivation- to pull them out. Because of these literal roadblocks, horses and carriages had to maneuver through the streets in a serpentine fashion. On Broad, this ultimately helped to produce a wider roadway. 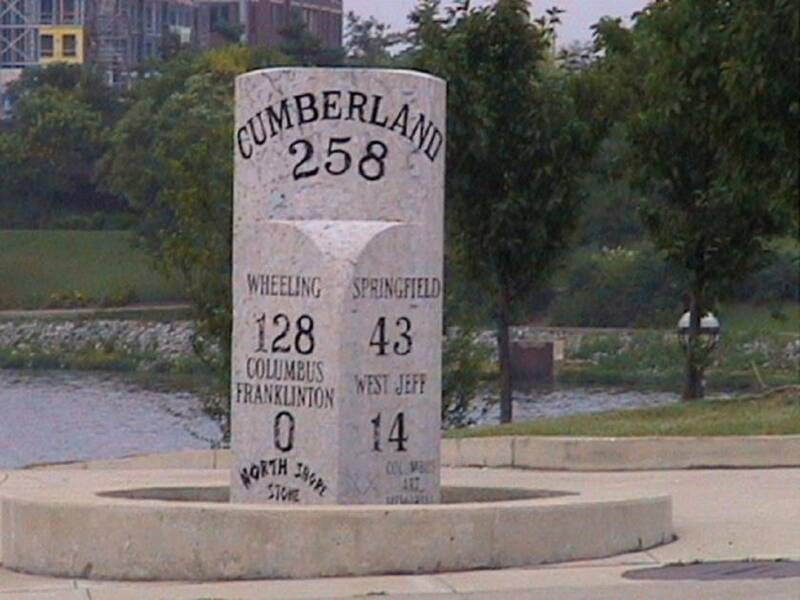 In 1806, Thomas Jefferson authorized construction of Cumberland Road, which would be the first section of the National Road, the very first multi-state, east-west roadway in the country. The National Road arrived in Columbus in 1833, following the course of Broad Street through the town. Historic mile markers from the National Road still exist, this one being in Columbus. Few upgrades came to the roadway (the tree stumps were long gone) with the National Road’s arrival. Until 1873, Broad remained a dirt surface. Gravel and broken rock were thrown down that year, finally easing the impassable mud fest that the street became after heavy rains. By this time, Broad Street had been changed in one other significant way- much of the Downtown section had been converted into park boulevards. 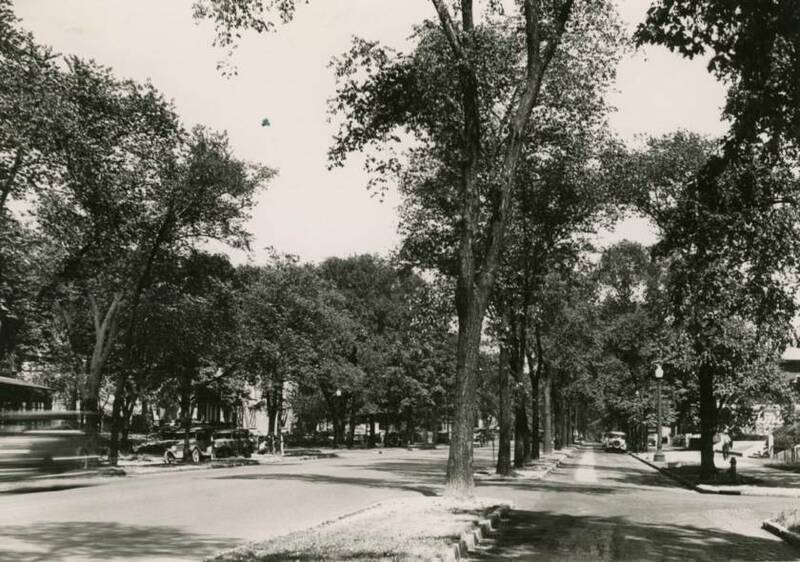 Considering how long it had taken to remove the trees from Broad Street originally, it was an ironic twist that prominent local businessman William Deshler decided that Broad Street needed some sprucing up after seeing the boulevards of Paris. In 1857, He designed and helped fund converting parts of Broad into parkways that featured landscaped, tree-lined medians and a much narrower layout. East Broad’s parkways in the 1920s. These parkways existed well into the 20th Century, but by then roadways were quickly being swallowed up with cars as they became the dominant form of travel over horse and rail. As such, many people increasingly saw the parkways as an impediment to traffic, if not an outright danger. In those early years of the automobile, with far fewer rules and safety features, it was not uncommon for careless drivers to crash into the trees in the landscaped medians and either suffer severe injuries or even be killed. So, with pressure against them mounting, and not a care or thought to pedestrians, the city put their future to a public vote in November 1931. In turn, the public voted to not only remove the roadways but also to further widen Broad Street by another 2 lanes. Ironically, even William Deshler’s elderly daughter voted to remove them, saying that the parkways were a nuisance to traffic. The following year, the trees were cut down, the medians removed and auto traffic reigned supreme thereafter. More than 40 years later, Mayor Tom Moody commissioned Montreal-based planner Vincent Ponte to come up with a new design for Broad Street Downtown. Ponte proposed converting the street back into a parkway similar to what had existed before 1931. The plan had some support from some city leaders but ultimately faded away due to lack of funding and concerns about hurting traffic. Another 15 years later and, in preparation for AmeriFlora ’92, part of the celebration of the 500th anniversary of Christopher Columbus’ landing in the “New World”, the city dusted off the Broad parkway plan again. AmeriFlora ’92 was planned to be a major international show, and the city wanted to put its best face forward. It considered dozens of potential projects that could move the city forward in significant ways. Transit systems were a heavy favorite, though smaller ideas like the parkway received plenty of attention as well. The city commissioned traffic and cost studies for the project, with the idea of creating a 10-foot-wide median down the center of Broad, along with landscaped curb strips. 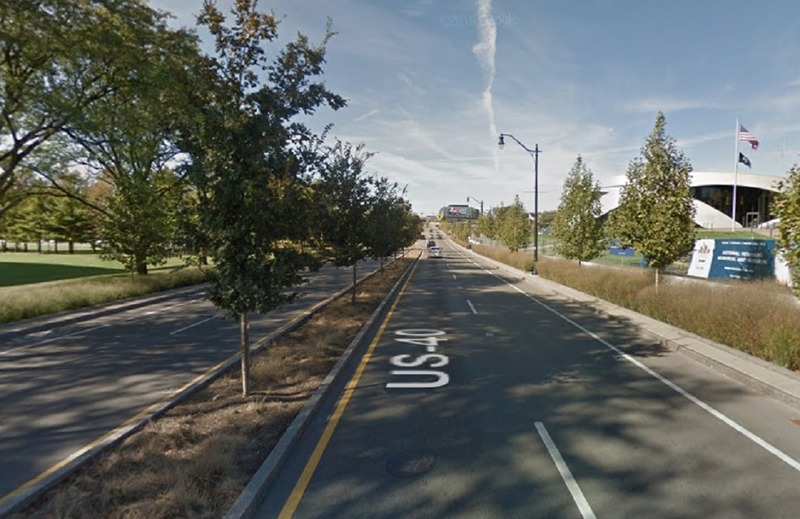 The median and strips were to contain thousands of trees and bushes. Ultimately, almost none of the proposed ideas went anywhere due to lack of funding, and AmeriFlora ’92 itself went down in history as a financial disaster. The parkway idea surfaced again in the late 1990s and early 2000s as Mayor Michael Coleman and the city looked into ways to make Downtown more attractive to potential residents. Downtown’s population was near historic lows and Coleman was really the first city leader in many years to heavily promote walkable, urban living, particularly in the city’s core. This plan seems to have advanced pretty far by all indications, with the city paying a design firm $10 million to complete studies and design work for the project. A tentative construction timetable for sometime in 2001 was even given. That timetable kept getting moved back, however, and eventually faded away altogether as the nation moved into recession. In 2010 as part of Coleman’s continued push to reinvigorate Downtown, the city released its Downtown Strategic Plan. In it were 12 infrastructure and beautification project ideas it hoped to accomplish over the following several years. Some of these ideas actually occurred, including the Scioto Greenways and Scioto Mile makeovers, while others such as a new pedestrian bridge from the Arena District to the Scioto Peninsula and a Downtown bike center did not. One of the dozen ideas was, you guessed it, the Broad Street parkway and road diet plan. 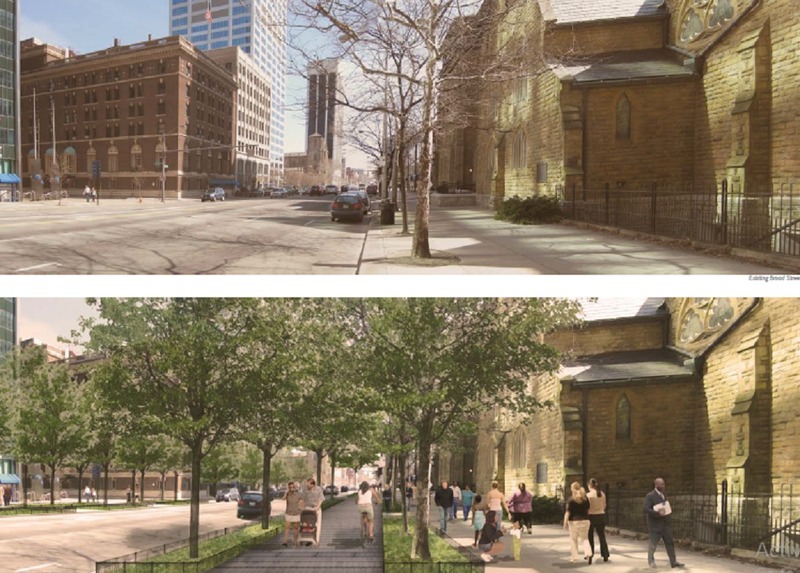 What could have been: A before and after rendering of the 2010 Broad Street road diet proposal. Like all the other times this proposal had been talked about, the problem seemed to be both funding and general worry about traffic. Columbus leadership has shown time and time again on this project and others that they get rather skittish when it comes to pulling back from the driving convenience focus when dealing with infrastructure projects. We can talk about funding all we want, but it seems an unlikely coincided that the only projects of the 12 that went anywhere had nothing to do with transit. Like 2010’s proposal, these parkway revivals ultimately failed due to a lack of political will. Franklinton is rapidly becoming one of Columbus’ hottest neighborhoods, with major projects both in the planning stages and under construction. One of the city’s efforts to help boost the neighborhood happened in 2017. Broad Street on the Scioto Peninsula between COSI and the new National Veterans Memorial received a bit of a road diet and painted bike lanes. This small makeover has, to this point in time, been the closest we have seen to an actual restored parkway. West Broad on the Scioto Peninsula. 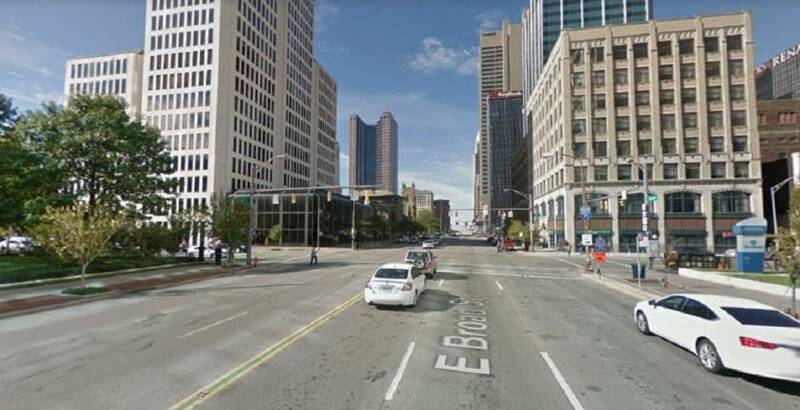 Seeing as how this section of Broad has apparently not significantly affected traffic patterns, the city recently announced plans for a road diet for the rest of Broad Street through the entirety of Franklinton. The plan calls for a reduction of traffic lanes and the addition of bike lanes on both the north and south sides of the street. Like so many of Columbus’ big ideas, it sounds good only until one further examines the details. 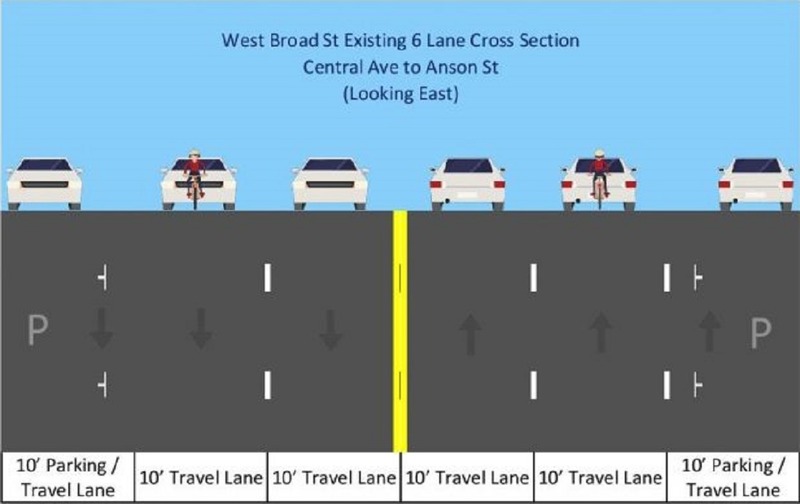 As the diagram below shows, the current configuration of West Broad Street through Franklinton is 6 lanes wide, with between 4 and 6 of those lanes being used for actual traffic. Two lanes are used as a mix between traffic and parking uses. It is an urban highway if there ever was one. The current West Broad configuration. The problems here are numerous, but let’s start with the hyped bike lanes. As with the small section on the Scioto Peninsula, the bike lanes will be painted rather than protected. Columbus currently only has a single protected bike lane on part of Summit Street, a roadway much narrower than West Broad. Painted bike lanes are better than nothing, but they are far inferior to protected lanes. This is because the protected variety are much safer for bicyclists, and therefore are much more popular with casual and regular bicyclist alike. If the city’s goal is to get more people riding bikes, protected lanes should be a far greater priority. The city claims it considered adding 10-foot-wide protected lanes, but dismissed that idea because Columbus doesn’t have the correct equipment to clear that size of a lane during the winter. That’s a curious excuse considering that the Summit Street protected lane is… 10 feet wide. So either the city is admitting it shirks its responsibility by not bothering to plow the Summit Street lane, or it actually does have the equipment to do so. Both cannot be true. Presuming that the city is responsible for its duties and does plow the Summit Street bike lane, why couldn’t the same equipment be used on Broad Street? Or if they really don’t have it, why couldn’t similar equipment used by many other cities already be purchased with the assumption that more protected lanes will be added to city streets in the future? At this time, there don’t seem to be any good answers to these questions. Not an imaginary bike lane on Summit. The other main problem with the proposal is that it’s really not a road diet in and of itself. Currently, two lanes are used occasionally for on-street parking, and during those times, they are not travel lanes. 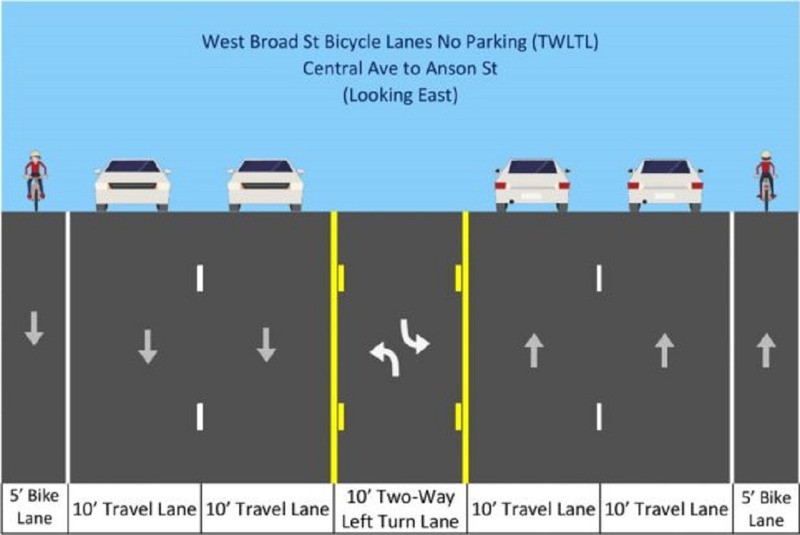 The proposal removes all on-street parking and instead creates a center turn lane. This means that instead of there sometimes being a maximum of 4 travel lanes, there will soon be a minimum of 5. This is arguably a step back from the current configuration and doesn’t make the street any safer for pedestrians attempting to navigate across it. This will become a greater issue as both residential and retail infill are added to the neighborhood. Walkability suffers when Franklinton’s biggest commercial corridor remains an urban highway. In fact, the center turn lane may actually make West Broad even more dangerous to pedestrians, as without it traffic is often slowed by cars attempting to make turns onto side streets. Without that inhibiting factor- and with no protected bike lanes making Broad feel smaller- traffic could actually speed up. And let’s not overlook the fact that the planted medians of the Scioto Peninsula will not be extended through the rest of Franklinton. Perhaps this plan is not even an example of “good enough”, but rather “even worse than it is now”. City leaders need to go back to the drawing board on this, and to be honest about what they’re doing and why they’re doing it. It’s certainly not to protect pedestrians or offer greater biking mobility. It’s to once again serve the car and really only the car, which is not much different than what the history of Broad has always been about. Other cities are making strides in making their cities far more friendly to all. Columbus still seems to be missing the point. Broad Street has a fascinating history that I’ve only barely touched upon, but it has been a consistently missed opportunity. There have been so many chances to make it into something special, and every time we’ve been left wanting. Columbus, don’t let this be another.